"Dear friends, we have reached the end of this year and stand at the threshold of the New Year. My wish is that the friendship of Our Lord, Jesus Christ, will accompany you each day of this new year. May friendship with Christ be our light and guide, helping us to to be people of peace, of his peace. Happy New Year to all!" Bishop Allen Vigneron's "10 Rules for Handling Disagreement Like a Christian"
If you've never encountered these rules, please read them. Memorize any that are not intuitive to you. I recently read a suggestion that Christians brainstorm a set of rules for internet-based discourse, rules like, "Assume the best intention and good faith of those with whom you are corresponding." A noble idea. I hope to be excused my copyright violations by my intent to promote others to purchase and read the books from which I copy willy-nilly. Here is an awesome passage from Fr. Walter Ciszek, S.J. 's He Leadeth Me. It's about his time in the prisons, gulags, and Siberian villages of the Soviet Union. Whatever the trials of the moment, whatever the hardships or sufferings, more important than all these was the knowledge that they had been sent by God and served his divine providence. I could not always fathom the depths of his providence or pretend to understand his wisdom, but I was secure in the knowledge that by abandoning myself to his will I was doing as perfectly as I could his will for me. Spiritual freedom of this sort, as I knew from bitter experience, is not something that can be attained overnight or ever possessed in its final form. Every new day, every new hour of every day, every new circumstance and situation, every new act is a new opportunity to exercise and grow in this freedom. What is required for growth is an attitude of acceptance and openness to the will of God, rather than some planned approach or calculated method. Even as ascetical (sic) practices such as penances, fasting, or mortifications can can be hindrances rather than helps if they are self-imposed. Striving instead to eliminate all self-will, to accept God's will revealed in the circumstances of daily life, is the surest way to achieve growth in conformity to the will of God. It will provide more than enough virtue to be practiced, suffering to be sustained, pain to be borne; more importantly still, it will make us fit instruments to achieve his designs, not only for our own salvation but for others as well. The service of God must take preference over all else. There is more, but you'll have to pick up a copy of the book and read it. O humility! O sublimity! Both tabernacle of cedar and sanctuary of God; earthly dwelling and celestial palace; house of clay and royal hall; body of death and temple of light; and at last both object of scorn to the proud and bride of Christ! She is black but beautiful, O daughters of Jerusalem, for even if the labor and pain of her long exile may have discolored her, yet heaven's beauty has adorned her. 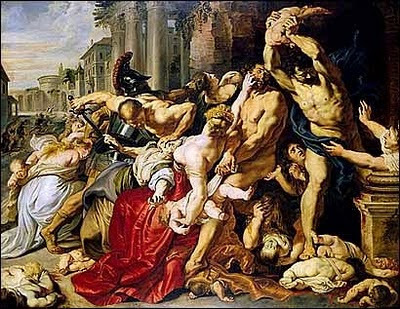 Today, Monday 28 December 2009, is the feast of the Holy Innocents, those children slaughtered by Herod (Mt 2:16) in his demented plot to destroy the Christ Child, thereby winning the notorious distinction of being the first manifestation of anti-Christ in history. The Church recognizes his little victims as something like martyrs, even donning red on their feast day in honor of their blood. They did not voluntarily give their lives rather than deny Christ, yet their innocence poured out still bears witness to His. In our times, anti-Christ has been powerfully active in many modern regimes. The Nazis and the Soviets were both explicitly anti-Christian. They were defeated, but we must not lull ourselves into thinking that anti-Christ was, or even that his plan was delayed. The Evil One is crafty beyond our reckoning. I believe that part of his plan was to discredit evil itself - he has done this by psychologizing sins into mere neuroses on the one hand, and by making us think that a plan or idea cannot be evil unless it is proposed by a short man with a funny mustachio and a German accent. We are mistaken if we believe either of those two lies. Sin is sin, and we are all guilty of it. Some sins are small, and others are immense. We must use our meager powers and whatever grace God gives us to resist it all. We cannot compromise with it, and must realize that the Enemy always tries to sell us sin by bundling it with genuine goods, because only a lunatic would pick sin otherwise. So intimacy and pleasure, both good, are used to sell adultery; adventure and profit, both good, are used to convince people to burgle or rob. Now health care is being used to push abortion. Make no mistake - unless the law specifically forbids the funding of abortion, it will be slipped in as one more entitlement. If the developers of the health care proposals under consideration did not want abortions to be funded directly or with subsidies, they would include prohibitive provisions in their bills. And I can think of no better way - nor can Uncle Sam - to encourage something, other than to pay for it. Please pray for Bart Stupak (D-MI) and the group he is rousing to resist this atrocity, this holocaust to Moloch. Rumor has it that he and his group are already being brought under tremendous pressure from the highest levels. Fellow Americans, we are capable of helping each other out without paying to kill each other's babies. America, we can do better than abortion! It’s often said, “Christmas isn’t about the gifts.” You know what? I never really bought that as a kid and I don’t really buy it now. In a certain sense, Christmas is all about giving and gifts. Specifically, it’s about the Gift: Jesus Christ, God-made-man. As I begin this homily, I want to address all of the children here. Now, my younger brothers and sisters, you know that Christmas is one of the happiest days of the year. It’s filled with cookies, toys, laughter, fun, hugs and all other sorts of happy things. It’s one of my favorite days of the year and is probably yours as well. But, I have to warn you that sometimes there is sadness and even tears on Christmas. Let me explain what I mean. You come running down the stairs at 4:00, 5:00, 6:00, or for those families that are lucky, 7:00 am. Your parents say, “Ok, take it easy, one gift at a time. Let’s go slowly.” But, of course, your deaf to all of this and you immediately start pummeling presents. One after another is torn from its wrapping, and you’re barely done unwrapping one before it’s on to the next. Then, you come across the present you desired so much or at least one that catches you off-guard by how cool it is. Out of the corner of your eye, you notice that your little brother or sister sees this present too, takes an interest in it, and comes waddling over. They politely ask, “Can I see it?” “No! It’s mine!” you respond. “But I just want to see it for a second.” As if it weren’t firm enough the first time, you reiterate, “I said it’s mine!” Then, suddenly, at 6:30 am on Christmas, the happiest day of the year, there are an abundance of tears. I tell this story because that response, “it’s mine,” is actually true. Don’t get me wrong, I’m not against sharing at all. But, who gives you a gift if they don’t want it to be yours? There’s something essentially true in the response of the six year old to his four year old sister. The gift is yours to have, to enjoy and to use. On the subject of gifts, do you know who gave us the greatest gift ever? Mary, our Blessed Mother, gave us the gift which surpasses all gifts, that of Jesus Christ. Without Mary’s consent, God doesn’t become man; without her consent, Jesus is not born. 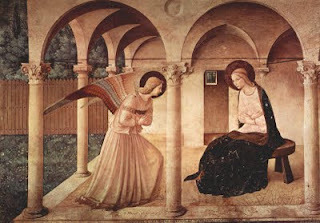 When Mary freely consents to Gabriel’s request at the Annunciation, she allows salvation to come into the world. And who is this gift for? When we look at the manger scene, we a whole host of characters adoring the baby Jesus. Mary and Joseph are of course there. There are the shepherds, who are poor humble Jews. In a couple weeks, the Magi will be there as well, and they were rich powerful Gentiles. We see the animals surrounding the scene and the angels hovering above. 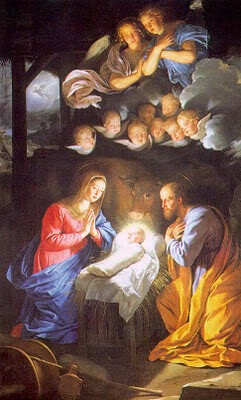 In essence, there is a microcosm of all of creation to adore the newborn baby Jesus. Mary gives this gift to all of creation, to all of us. I can give a gift to a family member or even a group of people, but Mary alone is able to give a gift to all of creation. On this blessed night, we thank Mary who holds the savior as her gift to all of creation. People ask us why we love Mary so much. I think a good answer is that in a real sense, she gave us salvation. That’s a pretty good reason to love somebody. Almost everything we say about Mary, we can say about the Church. For example, we say that Mary is holy. The Church is holy, as well (one of her four marks). Just as Mary is filled from her conception with the Holy Spirit, the Church is always filled with the Holy Spirit. Mary gives us Jesus, but the Church does as well. Through Mary, God gives us salvation, and through the Church, God offers us the same gift. Just as Mary gave us the gift of salvation some two thousand years ago, so the Church gives us that same gift of salvation today. Like the person who opens up their Christmas present and exclaims, “it’s mine,” so we can respond to that same gift of salvation offered us today. That gift is ours to possess, ours to enjoy, and use. Let me give an illustration of what I’m talking about. The Charismatic Renewal emphasizes the role of the Holy Spirit and his tangible, powerful presence in our lives. One of the ways the movement does this is through “praying over” people. The members lay hands on the person they’re praying over, and they call down the Holy Spirit, while uttering a prophetic word or maybe a Scriptural passage which may be relevant to the person. It can be a very powerful experience. A group of people were praying over me once, and one of them, a priest, said to me, “Dave, I think the Lord wants me to tell you something. He wants to let you know that he is yours.” I immediately thought that I must have heard wrong. He meant to say that I am God’s. I can understand that; I’m his because he made me. But the fact that the utterly transcendent God is mine seems too incredible. But that is exactly the case. God is mine. He is mine to possess and to love. This is the novelty that comes about as a result of the Incarnation. The Jewish people knew that they were God’s and certainly had some idea that God was theirs. But the extent of the imtimacy, the depths of their possession of God, was beyond their (and anybody’s) ability to understand. The first reading reflects the notion that God will become ours in a profound and unimaginable way. “As a young man marries a virgin, your Builder shall marry you; And as a bridegroom rejoices in his bride so shall your God rejoice in you.” God uses the union of marriage as a symbol of the manner in which he will unite himself with us. Even marriage, through which man and woman become one flesh, is not capable of describing the depths of the mutual possession between God and man: we possess God and he possesses us. In the second reading, St. Paul describes the effect of baptism on the Christian: “He saved us . . . by the washing of regeneration and renewal in the Holy Spirit, which he poured out upon us richly through Jesus Christ our Savior.” Even as the waters of baptism drip off us, and we dry off our heads, the Holy Spirit is poured more deeply into our souls—“richly,” as St. Paul says. The Holy Spirit, God becomes our possession, the gift poured into our hearts, at Baptism. He is ours to possess and we are to be possessed by him. Like any gift, unless it is used it is so easily lost. Imagine opening a gift at Christmas, thanking the giver, and then setting it aside. Then you forget about it; you never use it or think about it again, or at least very infrequently. It’s likely that we’ll lose the gift. It’s no longer ours. This can happen so often with this priceless gift of salvation that we receive at Baptism. Unless our lives are centered on the sacraments; unless we have a relationship with God through daily prayer; unless we lead lives that are infused with faith, hope, and love, we can so easily lose that gift which we celebrate tonight. On the positive side, the more we use the gift the more it becomes ours. Imagine opening a gift on Christmas, let’s say a Nintendo Wii. You play it for eight straight days. In the meantime, you don’t eat, drink, sleep or do anything else. Your friends think you’re crazy—and you are a little crazy. A friend comes over after eight days and watches you play a game on Wii. After watching you play, he’ll say, “Man, you own this game.” He’s right, the more we use a gift given to us, the more we own it, the more we enjoy it, the more it becomes ours. The goal of life is, to the extent that it’s humanly possible, to think as God thinks and love as God loves. This is possible, it’s our mission. It’s possible inasmuch as we possess God and let him work through us. In the end, Christmas is all about gifts. It’s not about the toys, new clothes or gift certificates. It’s about the gift of Jesus Christ given to us through Mary and through the Church. It’s truly mine and truly yours. Let us seek to possess this gift all the more and let the gift possess us in love. One of my favorite lines from the Scriptures is found in the Gospel of St. Luke, who recounts an interaction between Jesus and some Pharisees. Jesus processes into Jerusalem fresh from raising Lazarus (Jn 11), both followed and preceded by thousands of excited admirers (Jn 12:17; Mk 11:9), who are cheering "Hosanna," which means something like "God save..." or "Long live...", as in, "Long live the King!" The word hosanna is actually related to the proper name Yeshua, Jesus' name in his mother tongue. Trust me on this one. Now, as people are cheering, "God save the one who comes in the Name of the Lord," a reference to the messiah, the pharisees become perturbed (Mt 21:15; Jn 12:19). The Pharisees ask Jesus to tell the crowds to stop calling him King (Lk 19:39). Here's what Jesus says to answer them: I tell you, if these were silent, the very stones would cry out, (Lk 19:40). That's it. That's one of my favorite lines. Think about it - even the paving stones under their feet are yearn, bursting forth with the news that God has come to his people, that God has returned to holy Jerusalem, that God is going to reclaim his holy people. Even the stones! and like a strong man runs its course with joy... (Ps 19:1-5). Jean Corbon, who is said to have shadow-written the fourth part of the Catechism of the Catholic Church, which deals with prayer, wrote a book called The Wellspring of Worship. I highly recommend it for anyone who wants to understand what is the heart of liturgy. By "liturgy" I am not indicating any migration to an Eastern Rite. Still less am I getting hippified and refusing to use the word "Mass," which is the correct English-language word designation for what we Catholics are required to attend on Sundays and other obligatory holy days. Liturgy is a broader term whose translation is often botched as "work of the people." The Greek term, and its Latin loan word, both meant "public work," which is different. Works of the people include things like potluck dinners, spontaneous singalongs, and quilting bees. There are obviously people in the Church who want the Holy Sacrifice to fall into this category and so continue to promote this incorrect translation. A "public work" is different. In ancient Greece or Rome, liturgia would have described such things as arenas like the Colosseum, a new sewer system, or a nice fountain. Modern things like the Washington Monument, Fed-Ex Field, or your local public school serve as modern equivalents. Then as now, the state built such things, and so did very wealthy, private benefactors. They were gifts to the people, and very often built by the people, and in those senses were "public works"; but they most certainly were not the brainstorms of people on the street, or for that matter, people in the pew. So it is with the Mass. The Mass is a gift to the people and not from the people. It originates in Jesus Christ's sacrifice of the cross because we need it, and not because he needs it. And the Mass is one instance of liturgy. I wish I could paraphrase Corbon better, but I haven't got my copy of his book handy. I gave it away in a moment of blind affection. Ah, well. It's on my Amazon wishlist. Lol. I mention all of this now because I came across the YouTube video below on the Anchoress's blog. If what I wrote above seems kind of abstract, watch the six minute beauty below. Heck, even if you got what I wrote above, which given my penchant for Ryanese strikes me as a bit unlikely, watch the video. Do you see what I mean now? EVERYTHING: my car wreck a week or so ago that taught me a little obedience to the divine will, the snow that swamped DC this past weekend and made us rest and stay at home, baptisms and transubstantiations, animals in the zoo, sunny days on mountaintop meadows, all of it... it was all created by God because he loves us and wants to teach us to love Him in return. As we learn to enter into it, to discern his will, act charitably and as good stewards, respond with gratitude, we do in fact draw closer to him. Everything is meant to build this reality into us, and especially the sacraments are meant to do so in a way that nothing else can. Jesus, the Gracious God Made Flesh, became flesh precisely so that grace can operate in fleshly things. He would not have heaven and earth, the spiritual and the material, separated forever. In his nativity, God becomes a native of planet earth so that we can become strangers and exiles here, with a new citizenship in heaven. It's just amazing what he did that day two thousand years ago in Bethlehem. Creation is still reeling with the ripples of God diving into his own creation, to change us from the inside, to teach us to praise his Father in every circumstance. Hosanna! Blessed is he who comes in the Name of the LORD. Hosanna! Dear young people, many false teachers point out dangerous ways that lead to fleeting joys and satisfactions. Today expressions of our culture are mired in superficiality... Refuse to sell your dreams too cheaply! Dream, but in freedom! Plan, but in truth! The Lord is also asking you: "Will you also go away?" Answer with the Apostle Peter: "Lord, to whom shall we go? You have the words of eternal life" (Jn 6,68). God alone is the infinite horizon of your life. The more you know him, the more you will find out that only he is love and an inexhaustible source of joy. But to enter and remain in contact with God it is indispensable to establish a deep relationship with him in prayer. When it is genuine, prayer spreads divine energy in every context and at every moment of life. It makes us live in a new way. Is it not prayer that made Francis a new man and Clare a source of light? I love that speech to the second international meeting of "Young People to Assisi". You can read the whole, brief thing by clicking here. The quotation from St. John's gospel is among my favorite. It's a great one for prayer when I am tired of following Jesus sometimes, or feel like giving him an ultimatum to do things my way. "Jesus, you better... or else I'll walk!" So many times the words of Peter have drifted back into my heart and mind at those points. "Fine. I guess I'm still yours, thick or thin." At this time of the year, we do especially well to reinvest ourselves in Jesus, who is the source and summit of authentic human happiness, and to ask him with renewed fervor to reinvest Himself in us. Come, Lord Jesus! This carol is one of my favorites. I think it dates to the mid-Victorian period, so it's relatively modern. It has been used to start the Lessons and Carols at King's College, Cambridge, every year for almost a century now. It's not hard to hear why. Leaders among pro-life Democrats in the House of Representatives include Bart Stupak, Tim Holden, Kathy Dahlkemper, James Oberstar, Dan Boren, Gene Taylor, and Jim Marshall. Of these, only one (Dan Boren) is non-Catholic. We've all heard about how many of the leaders of the pro-abortion lobby in the House describe themselves as "Catholic." This is huge. It means, as far as I can tell, that what we are witnessing unfolding is not a battle between Democrats and Republicans over abortion or abortion-funding. 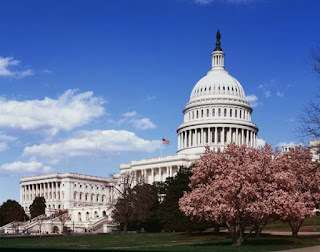 We are witnessing a battle among Catholics, with the United States House of Representatives as the battlefield, and government-funded abortion as the current strategic target. This is huge. It may be apocalyptic in the truest sense of the word. The Greek word apocalypsis means "unveiling" and is translated into Latin as revelatio, from which we get the word "revelation." The Book of Revelation, by prophesying about events at the end of the time, ought to expose us to ourselves. It ought to make us stop and think, "Say, what side am I on? Have I really given it over to Christ? Or do I just want to feel good about myself by calling myself a Christian?" We are seeing such a revelatory conflict now in our legislature. It is to some degree a microcosm of America, where the same conflict as a whole is underway. It is easy to call oneself Catholic and to play that card whenever convenient, as a sort of credential about having roots or deeper values or something. It is a lot more difficult to actually sink roots and stand for something, like, say Jesus Christ. It might sound revolutionary, I know, or radical, or even revolting, but that's what I thought "Catholic" meant. Now we are seeing in our legislature and in our society as a whole who has actually believed that, and who has only used that popular belief to their own personal gain. Again, no need to worry. This stuff is all over the gospels and epistles. Jesus himself told us that these things would happen so that when they did, our faith in Him would be deepened rather than shaken. Let's keep praying, doing what we can, and trusting in Him. 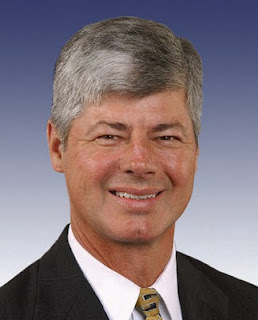 Rep. Bart Stupak (D-MI) has said that he finds the Senate's "pro-life" amendment to be unacceptable. Some people are hoping he'll lead a sally of House Democrats to kill Obamacare when the reconciliation committee is done building its Frankenstein from the House and Senate bills. I am not too worried about Obamacare passing - at least, not worried enough to go on a crusade about it. I think it will be a catastrophic mistake, but merely a economic-political one, that is, a merely this-worldly mistake. It will be a secular mistake rammed down the throats of Americans by a secularist minority. That's bad, but it's also nothing new. Entitlements are created, entitlements can be eliminated or privatized - look at welfare reform. It's abortion that's the problem. Funding abortion, subsidizing abortion, paying for other things so that people have leftover money to buy abortions - it's all just one big encouragement, especially for the poor and vulnerable - to murder their babies and to lose their souls. Lost lives are never reclaimed, and alas, too many lost souls go unredeemed. We Christians cannot sit by idly and chatter aimlessly about such things. I do not hope that Stupak will kill Obamacare, though that would be nice because our country is teetering on the edge of economic ruin - and I don't mean the recession - I mean the colossal debt we've racked up. I DO hope that Stupak will be willing and able to kill Obamacare, and will do so, rather than let it finance the slaughter of innocents. We need to pray for Rep. Stupak, a fellow Catholic who is faithful to the teachings of the Church, and also for those Democrats especially that are aligned with him. He will certainly come under intense pressure from the unscrupulous faux Catholics that run the House. Do you know what this number is? Don't look to see what this link is about before you click it. Just trust me and click here and watch it for four or five minutes. We need to pray very, very hard for our country. We Christians need to lead the way in learning to live a life of disciple and self-sacrifice if we are going to get ourselves out of this mess in a morally legitimate way. Glorious God, give me grace to amend my life, and to have an eye to my end without begrudging death, which to those who die in you, good Lord, is the gate of a wealthy life. And give me, good Lord, a humble, lowly, quiet, peaceable, patient, charitable, kind, tender and pitiful mind, in all my works and all my words and all my thoughts, to have a taste of your holy, blessed Spirit. Give me, good Lord, a full faith, a firm hope, and a fervent charity, a love of you incomparably above the love of myself. Give me, good Lord, a longing to be with you, not to avoid the calamities of this world, nor so much to attain the joys of heaven, as simply for love of you. And give me, good Lord, your love and favor, which my love of you, however great it might be, could not deserve were it not for your great goodness. These things, good Lord, that I pray for, give me your grace to labor for. Amen. HEEEEEEEELP! 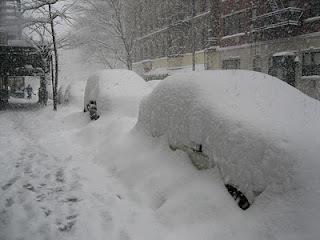 We have easily TEN inches of snow on the ground and IT'S STILL SNOWING! I just got back from seeing "Invictus" with a friend at the movie theater. I can truly say that this movie is one of the more inspiring true-story movies I have seen. 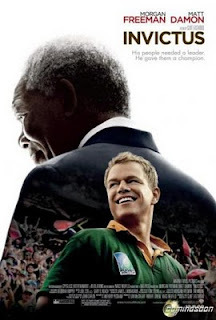 It is the story of how Nelson Mandela decides to promote the South African national rugby team, the Springbokke, as a means of advancing racial reconciliation in his country. He openly supported the almost all-white team, and gained the support of the team's sympathetic captain. Moreover, he encouraged and protected white South Africans' sense of their culture's place in the new regime. The team's white captain in turn encouraged the team to get on board. When the team began visiting poor black enclaves to give rugby camps, the team became more sympathetic to the situation of South Africa's black population, and South Africa's black population found themselves getting excited about the team. The movie does an excellent job of showing how Nelson's gambit of generous forgiveness pays off by bringing hostile factions together in a way that nobody could have expected. South Africa is today a testimony to how cycles of violence can be derailed by the intervention of grace and forgiveness. I know lots of people who are having babies. Babies are beautiful. Now there is a documentary called "Babies," coming out, and it looks pretty... well, beautiful. Here's the website. It seems to be about the first year in the life of four babies from different places around the globe. The people responsible have a few weird movies, but this one looks good. Thanks, Anchoress! First Things has on its website a blogger who goes by the moniker, "The Anchoress." She is very lucid and recently wrote a post that is mind-blowing. Her language is simple, straightforward, and so elegant. Her theme important. Her thesis correct, I believe. And she provides excellent guidance for understanding President Obama and what we are to do about him, as Christians; at least, part of what we are to do about him. But always it is through an act of God, hidden or open, that faith, hope, and charity are possible. The theological virtues awaken and grow in human hearts bu the work and teaching of the Holy Spirit. That divine teaching is sometimes quite disconcerting. Let us look at the way the Holy Spirit acts within us. There is no way to chart all the Spirit does in any life. We can't set rules for it or plan it. "The wind blows where it wills, and you hear the sound of it, but you do not know whence it comes or whither it goes," (Jn 3:8). Yet, certain constants can be traced. The mysteries of the Rosary can help us see that. Some outpourings of the Holy Spirit illuminate and reveal, some strip and impoverish, and some confirm and fortify. All three kinds are necessary: the first to give birth to faith, the second to teach us hope, and the third to give us the courage to love. The author then proceeds to use details of the life of St. Peter that are recorded in the gospels as illustrations of his interpretation. When I read this tonight in adoration chapel, I literally jumped in my seat. "Holy crap!" I thought. I know, not terribly pious - my apologies. "That's my life." There's a lot of brain food in Fr. Philippe's words. The book is simple to read, yet thick - one doesn't rush through such things. I hope my mind isn't doing cartwheels still when I lay me down in a little bit. Some "civil rights" groups have decided that it is important to get out the vote, and by correlation, to make sure as many (minority) people as possible are counted in the upcoming 2010 census. Below, see one poster developed with the intention of deployment in Hispanic Evangelical churches. The poster below, of course, is the English text; the both the English and Spanish versions are available here. 5. It is arguably a violation of the legitimate separation of Church and State to employ churches in purely political work, although because the Census office is not actually involved with the poster, I am not sure that it is... this requires some mulling over. USA Today has a reasonably balanced news story about the ad campaign. To register your shock and outrage, you might go to the feedback page on CivilRights.org's website. In my gut I feel there are more reasons to object strongly to this sacrilegious propaganda, but I cannot think further now, because I am still sputtering. Thanks to Mr. Dave Tenney for pointing this out to me. This post is written with my anonymous agnostic poster in mind. The rest of you may listen in as well, and I am happy for the feedback you might provide. Jesus is the Word of God - not mere words spoken by men - but the Word become a Man. Up until that, Father Johnson's points were fairly clear and encouraging. Then, however, out comes a statement which makes no sense. What exactly do you mean? How can a word transform into a person? I'd have an easier time of it if it was worded like 'God magically created a humanoid embodiment of His defining characteristics and called it Jesus'. At least then I know that there's an indescribable plot device involved. OK, so first, let's look at what we mean by a word. A word is a bit of sound, but it's sound intentionally formed to convey a meaning. Now, as Christians, we believe that everything is for a purpose because God, when making everything, had a purpose in mind. Everything that's happened since has had a bit of that purpose. The purpose of words and of language is to convey meaning, but not just any meaning. They are meant to convey truth, that is, reality as sincerely understood in the mind. I might be mistaken, but yet speak truthfully, if I speak what I truly believe to be real, true. We can call this communication. We could also call it something similar in meaning: sharing. The purpose of me doing so is to take what is in my mind and put it, by means of my mouth, voice, and your ears, into your mind. But if I deliberately speak not truth, but falsehood - saying not what is true, but merely what will get me what I want, then I deceive and twist. Now God does not speak falsehood. It would be contrary to his nature. That's a separate conversation that we can go into later, but now, suffice it to say that he cannot lie. He knows the universe because he made it and permeates it, exists outside of it and everywhere inside of it. It is at this point that we enter into a mystery. A mystery is not, for a Christian, a whodunnit to be solved. Rather, it is the result of contact with the divine. God is so freaking big, infinite, that we can never understand him - except little bits here and there. It's like laying on your back and looking up at the clear blue sky - we can never see the whole thing at once, but only parts of it. Have you ever noticed that? It's because we're finite. So when we encounter God, it always leaves us feeling a sense of being small, but in a good way, or of him being big, but not in a bad way. Encountering him is like standing at the base of a Rocky Mountain and looking up at it. So here is the mystery. God, who needs nothing and is complete in himself, decided to share himself, to communicate himself, with us who rely on him for our daily bread, our every breath, whether we realize it or not. Infinite him wanted to put something of himself into finite us. He does so first by speaking into the hearts and minds of the prophets. Now, he is a pure spirit, so even referring to him as he is selling him short. But in English, it is only worse. For other reasons, we tend to stick with he, but it's nothing we need to get stuck on right now. The point is that as a pure spirit, God doesn't communicate with soundwaves from a mouth, but by inserting thoughts and evoking feelings - "Heart speaks to heart," a very wise Englishman once wrote. We see something like this phenomenon between people who know each other very, very well. A simple glance across a crowded room is enough to let one spouse know the other's heart. They sometimes anticipate each other's thoughts while physically absent from each other. In ancient times, God spoke to the prophets in this way. The quality of their lives opened them up very deeply to receive whatever he might want to share with them, and he shared with them so that they could speak aloud to people whose ears worked, but whose hearts were harder. This belief is shared by Christians and Jews, and we call those ancients the prophets, because the Greek word means one who speaks on behalf. Now, God employed the prophets to teach people his will, the way of life that he designed to bring them optimal happiness. And he taught them successively deeper lessons. They started simply, "There's one God, who saved you from slavery and will provide for your needs. That's me." The messages to the prophets became more intense, but never really got much more complex. He started adding hints of a deeper message though, but it was a hard one to believe. The message he started to add was, "And I love you." That's the hard one. In a world broken by violence so badly that even families are broken by violence, it can be hard to believe that the Mind-Behind-Everything cares about a little individual old me, can't it. Atheists try to make it out like believing in God is some big leap of faith. But, my dear Agnostic Reader, you and I know that it's almost commonsense. God virtually screams at us, "HERE I AM!" everywhere in nature. The leap of faith isn't that Someone made all the stuff that couldn't have happened by accident or chance. The leap of faith is that Someone loves us. So the Christian belief is that God made the leap of faith for us. In the most fabric-of-the-universe-shredding leap possible, he himself became a human being, just like the rest of us, so he could show us in terms that we'd understand that he loves us. When we say the "Word became flesh," or the "Word became man," we mean a lot of things. For now, it is enough to say that God took what he knows of himself, his own self-knowledge, and using the same infinite power that created the universe, made it into a man who was conceived in a woman, born as a baby, and grew up to be known as Jesus, a man of Nazareth. This belief is lunatic and weird, and insane, and how it can be other than "God is all-powerful," I cannot understand. But it is exactly what Christians believe happened in a particular town in a particular country at a particular time and place. So this man, Jesus of Nazareth, was both fully a human being who bled if cut, had feelings, had to grow up, learn to tie his sandals, and all of it - and yet was also every bit as much God. He was God revealing himself, communicating himself, wording himself to us, if you will. He was God sharing himself with us. And he did it because he loves us. He wanted to show us how much he loves us. Everything that happened to him afterward flows from that. Jesus of Nazareth lived and worked among particular people and built up a following of people who are in part intrigued by his interpretation of their moral laws, and in part eager to experience one of the wonders that he had been said to perform. He did not let them down, either, but worked numerous miracles without ever seeming chiefly interested in them. He began to intimate to his followers that he was God, or the Son of God, or one with God. It must have been hard for them to tell exactly what he was driving at because they don't seem to have understood for some time. His teachings became more radical and he directly challenged the religious leaders of his day because of their hypocrisy. They conspired against him and had him executed. But on the third day he rose from the dead, his body transformed and his mannerisms wholly different. For a bit over a month he walked among them again, but never stayed with them for very long. At this point, he seems to have been mainly interested in them knowing that it really was him, and that the one who had been slain had been raised. Then, in a last supernatural feat, he was taken bodily to heaven, which is weird, because heaven is not at the moment a bodily place. But taken he was. Now we Christians believe that 2000 years later, he is still speaking to any who will listen. He can do this because he is not dead, but is risen, because his human body is not rotting but is raised and transcends mere physicality. He does this as he as spoke to the prophets, by provoking his message to arise in our hearts and minds. 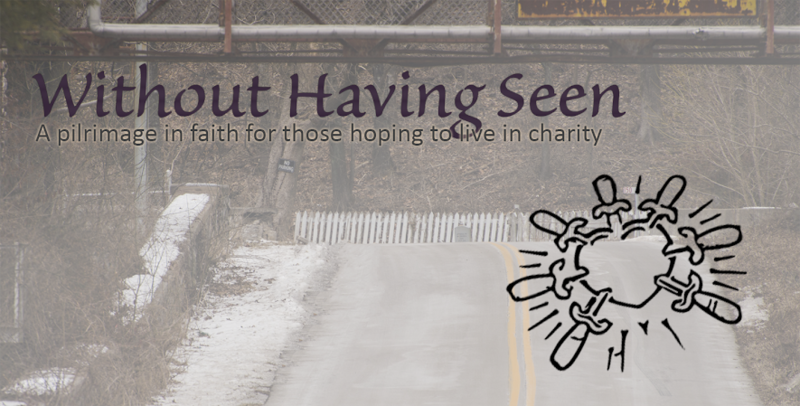 If we are too busy racing around doing stuff, his message will only occur to us as some sort of irritating or unanswered twitch in the back of our mind, or some sort of unease in our heart, an unexamined stirring of our conscience. But it will not get through to us very easily unless we take time out to attend to it. Now, I don't believe that this is all mumbo-jumbo, because I have experienced it. I believe that on a number of occasions God has given me clear instructions while I prayed, and has also consoled me by changing my heart in ways I could not do myself. But I also know myself somewhat, and know that I am more than capable of making up mumbo-jumbo. It is entirely possible for me to think, "Oh, God told me X," when in reality I merely have indigestion, a short temper, or a bad night's sleep. It is important for me not to take too seriously the things I think that God has said until I arrive at some sort of verification that is more objective. So, dear anonymous reader, I hope that this response addresses your concerns, even if - I am sure - it doesn't exactly clear them all up. Keep seeking God. is drained from the priest's vestments, leaving them rose in color ("It's not pink!" they're often heard to say). And it was upon this Sunday, at about 2 p.m. I found myself unexpectedly standing in the rain along 16th St. NW, a heavily trafficked corridor, next to the-wreck-that-had-been-my-car-only-minutes-before. It was cold, and I was dressed nicely for a community service activity to which I had been running late, at which I would now be unable to attend, waiting for a tow truck and a ride from my roommate. 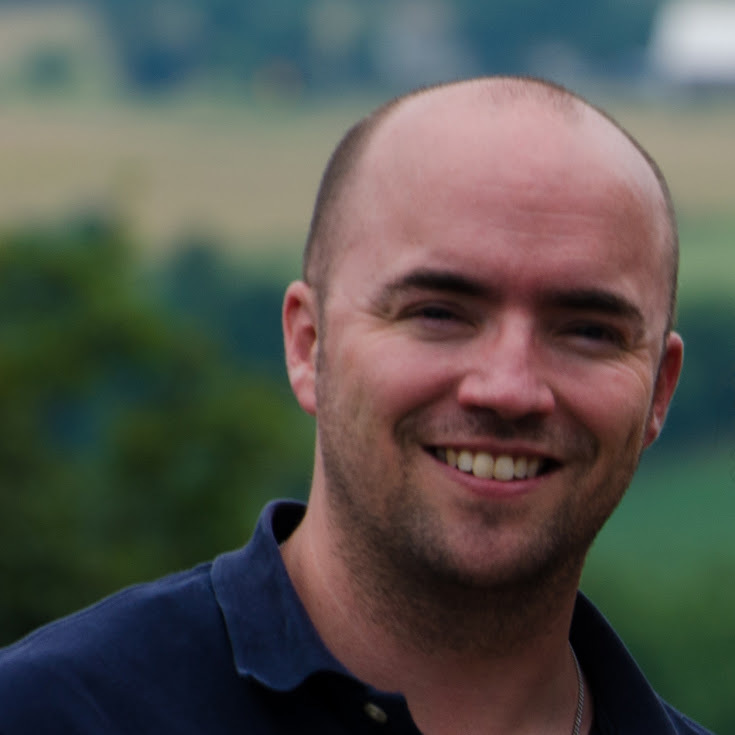 It was only seconds after the car accident that my brain whirred, "I don't have full-time work. I don't have much savings left. My car is totaled. How can this be? Why me?" When I saw that the other driver was uninjured (as was I) but that her car had only some scratches and cracks in the bumper, my sense of the world's mocking unfairness only increased. But now, fifteen or twenty minutes after the accident, as the rain drizzled on my forehead, I realized, "This has all happened for a reason." In that moment of a grace, I felt a thorn or splinter remove from my heart, and the self-pity evaporated. The self-pity and the fear were alleviated. One moment they were there, and at the next they were not. Instead, a confidence of the all-encompassing providence of God's will began to penetrate into my heart. Then a confirmation came to me from God. Actually, she drove up. She was an Ethiopian woman, and she rolled down her window and said me, "Are you alright?" When I nodded, she burst into a smile that chased away the clouds in my heart and made me smile as she cried, "Praise Jesus! I am so glad that you are well! See, it is a miracle, and for some purpose. Do you have anyone coming?" I told her my roommate was coming. She smiled and said, "It is for something. Do not forget that Jesus still has you!" And she drove off. If I did not get the message, another Ethiopian woman drove up. I'm not kidding here. The odds seem slim, but it makes me wonder if the services of an Ethiopian church were letting out. She rolled down her window and told me that she liked my bumper stickers. Ending abortion is a passion of hers, she said, and that I should not worry about distractions and turmoil the devil will send to me. "You are well and God will bless you. Trust Him! Do you need to use my cell phone?" I thanked her and declined the favor, telling her that my roommate was on the way and so was a tow truck. She smiled and wished me well. I noted that her car as well as the first Ethiopian lady's both had dents in them from collisions. They had experienced my little trauma, and quite probably far worse. But how they smiled! After the tow truck took brought my car back to my home, and my roommate brought me back in his car, he and I went to Mass together. The priest punctuated a theme that my roommate and I had been discussing just a day or two earlier. Christian Joy is not a giddy thing, or a naive thing. It is not an emotion any more than love, he said, but it is an anchoring virtue, a continual knowledge or memory of the presence of God in our lives and in the events of our lives. Joy makes the deaths of loved ones tolerable, and weddings not merely happy, but hopeful and passionate. It makes births beautiful and injuries feel passing. Joy maintains an equilibrium, and without negating anything, accentuates the good in how we perceive everything. It does not dispel the troubles around us, but keeps them from penetrating too deeply into us. It keeps God in the back of our mind and disposes us to respond to Him in the events of our lives, rather than to our own emotional responses. We Christians make a grave mistake if we confuse joy with an emotion. If we think we are sinning by being sad, somehow disobeying the command to rejoice; or that we are "in grace" or consolation when things are pleasant, then we shall never see the face of God because we will have already forsworn the Cross without even noticing. Because joy is a knowledge and a decision, it is also a virtue, one that we can pray for and practice. Joy is a virtue obviously connected to the virtues of faith and hope. So though I felt sad at my loss, and still feel a bit of trepidation at the possible outcomes of my situation, my heart keeps gravitating, almost on its own, but really under the impulse of grace and the discipline of training, toward gratitude and trust. I am grateful that I have family and friends who care about me, limbs that are healthy and strong, a mind that is sharp, and possibilities unfolding before me, albeit slowly and in their own time. I am grateful that nobody was injured, rather than upset that my car will probably be totaled for a pittance. I am grateful for the gift of faith to see God's love even in darkness and in rain. I am grateful not to feel overwhelmed, but supported and protected. And I have not given up waiting to see how Jesus is acting in my life. I hope that you, dear reader, have not either. 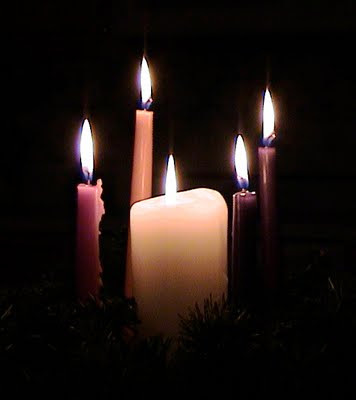 This Gaudete Sunday, some key lessons were driven home to me, if you'll forgive the pun. Some other food for thought has been churning around in my head. I also have reason to believe from past experience that this day will turn out to have been a significant and good one when I reflect back upon it. We celebrate the Word of God coming into the the world made by God on Christmas Day. The Holy Family was turned away from the inn because there was no room. The inn of our hearts are often cluttered with sins that prevent the Christ Child from being born anew in our own hearts and lives. What better way to clear out the clutter and welcome in Christ, than by going to confession. If you haven't in a while, all the better to go now. Remember, we Catholics are required to confess to a priest at least once each year. Why not before Christmas? Below is a brief video produced by a friend of mine on how to make a good confession. Beethoven's Moonlight Sonata, 3rd Movement - set over the Alps. What does this dogma mean? Why did Pope Pius IX bother to proclaim this small point, surely unimportant for our salvation, and that while Europe was reeling in the aftermath of continent-wide insurrections and revolts? Didn't he have more important things to do? The Dogma of the Immaculate Conception firstly reminds us of the Virgin's sinlessness. In doing so, the dogma indicates our great worth - the heights of which we are capable, supplied with grace. Secondly, the dogma implicitly reminds us of our own sinfulness. The fact of her sinlessness is noteworthy enough precisely because of our sinfulness. Far from being irrelevant to the times, the timing for the dogma's proclamation couldn't have been better. The revolutions that rocked Europe in 1848, and whose effects lingered in men's minds for decades, were predicated on Enlightenment ideas. One of those ideas was articulated by Rousseau, among others; namely, the people are born as tabulae rasae, as blank slates. Only corrupt institutions corrupt people, and by changing the institutions, we can change the fundamental character of the people in them, and thus of society as a whole. That was one of the Enlightenment's major conceits about the nature of man. One hundred and fifty years before the Enlightened West lost all faith in that proposition, Pius IX shouted - "No! There is ONE fresh start for humanity, one clean slate! Humanity is fallen, and we cannot trust ourselves apart from God!" Not many people listened, and for the following 150 years, Enlightened leaders have continued bumbling around like bulls in a china shop, smashing hundreds of millions of human lives in countless social engineering programs to show us how infinitely malleable man is, trying to remake the world in their own image. Jesus Christ, too, is remaking humanity in his own image. The differences are immense. Most importantly, Jesus Christ never quenches a smoldering wick or crushes a bruised reed. He does not impose his plan upon humanity, but rather invites us to join in his work. There are no gulags or inner-city ghettos in Jesus' way of doing things. Christianity's central message is something like, "Human beings are sacred creatures fallen into sin and in need of a savior. Jesus Christ is the savior of humanity. If we do what he says and unite ourselves to him, we will grow in joy here and now, and hereafter as well." The Immaculate Conception speaks to that first sentence: it reminds us that we are sinners and do not need a new system, but a savior; it tells us that we are not junk to be crunched in the social machine by the worldshapers, but jewels in God's crown, worth the labors of the Almighty (or so he seems to have thought) to save us - each individual precious and beloved. Latreia has a very specific meaning. Latreia is not just "whatever is higher than hyperdulia." It is very clearly, specifically "ministerial service," (see any Greek lexicon) and it refers to the service of the altar - to sacrificial worship. For Protestants, who have ejected the concept of sacrifice from their acts of worship, one act of reverence and devotion blends with another - prayers, catechesis, song. 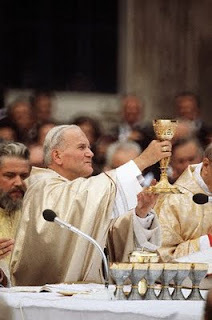 It is not so among us Catholics, because we have the Eucharist - not merely a memorial, but a re-presentation, a re-manifestation, a re-engagement - of Christ's self-sacrificial oblation. The Eucharistic Sacrifice is the act by which Christ worshiped the Father, and it is the act by which Catholics and the Orthodox worship the Father, because it is the way that he instructed us to do so (Mt 26:26-29; Mk 14:22-25; Lk 22:19-22; 1 Cor 11:23-26). That is latreia, and it is reserved for God the Father alone, in Christ, by the power of the Holy Spirit. Singing, prayers, preaching - those are nice, but they aren't what we mean by latreia. At the Mass and in the rest of our lives, they build up to the latreia. That's what they are for, but they are not the "source and summit" of our life - rather, they draw us closer to God. That is why we can devote them safely to the saints - because the saints draw us closer to God as well. It is impossible to learn about their lives and to attempt to imitate them without growing closer to God... because the saints are saints precisely because of their closeness with God. Mary is the greatest saint because she is the closest to God. She was so close to him that she bore him nine months in her womb, and many more in her arms. He surely followed her example as a child, and she followed his as an adult. She restrained him when adolescent exuberance would have launched his ministry too early, and prodded him before it was too late. She followed him around as he preached, and she met him on the Way of the Cross as he died. She alone among women is named as among those present in the Upper Room at Pentecost - surely not at the periphery of the Apostles, but at their center as the one who knew Him best. The Holy Spirit descended upon her to conceive in her the Messiah of Israel, and descended upon her and the Apostles to bring the Messiah out to the world. Whoever would denigrate such a relationship has either not thought it through. She is not one among many Christians or saints - she is absolutely unique among God's creatures. If we honor our mothers with dulia (devotion), surely something higher is owed the Mother of God. And that is what is hyperdulia means: higher devotion. Ice cream, à la mode. 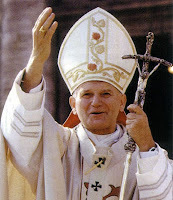 "It is Jesus who stirs in you the desire to do something great with your lives, the will to follow an ideal, the refusal to allow yourselves to be ground down by mediocrity, the courage to commit yourselves humbly and patiently to improving yourselves and society, making the world more human and more fraternal." Have the capacity to love. Of course, those of us who are immature are likely to still give ourselves passing marks. Dietrich von Hildebrand tells us that we must always confront our actions, thoughts, and feelings with the person of Jesus, hold them up to Him as if to a mirror. In doing so, we may come to feel judged or scolded - that is a temptation from the devil to believe that God is judging us. We must not believe it. The voice of Jesus calls out like a shepherd to sheep (Jn 10), and as we come to know Him better, we will hear His gentle voice leading us in the paths we should take, to be the men and women we should be. If we try to listen to Him, He will not speak to us as He spoke to the spiritually-deaf pharisees. When He speaks to us, even to say something very hard, as He must sometimes do, He will be as gentle as possible. Very often, His message will arise in our hearts as a simple recognition of a hard truth about ourselves. Today, the Gospel reading at Mass was one of my all-time favorites. I have decided to copy it below, but from the RSV, which is, as usual, lovelier than the NAB translation of the same passage. In that same hour he rejoiced in the Holy Spirit and said, "I thank thee, Father, Lord of heaven and earth, that thou hast hidden these things from the wise and understanding and revealed them to babes; yea, Father, for such was thy gracious will. All things have been delivered to me by my Father; and no one knows who the Son is except the Father, or who the Father is except the Son and any one to whom the Son chooses to reveal him." Then turning to the disciples he said privately, "Blessed are the eyes which see what you see! For I tell you that many prophets and kings desired to see what you see, and did not see it, and to hear what you hear, and did not hear it," (Luke 10:21-24). This prayer of Jesus is laden with terms, phrases, and themes used in the Old Testament in the prayers offered by prophets to thank God for his mighty deeds, like when Jethro thanks God for having delivered Moses from Egypt (Ex 18:8-11). The second part, about eyes seeing, etc., is a definite answer to Isaiah's prophecy (Isa 6:9-10; 18:3; 29:18; 32:3; etc). 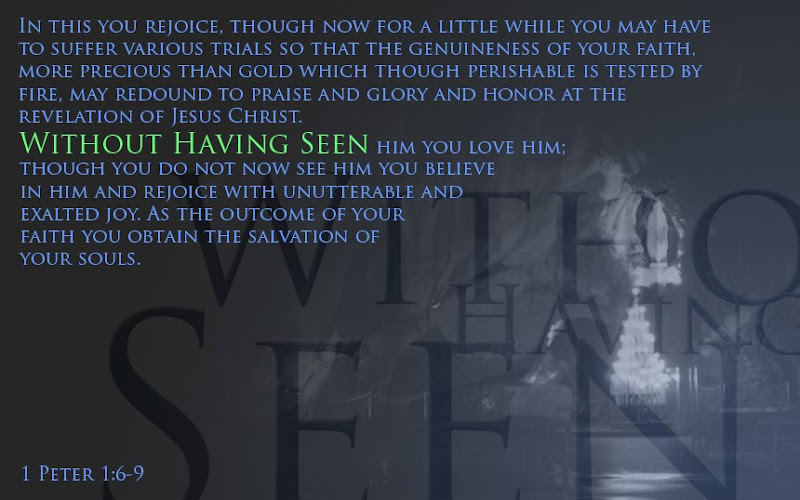 Though Isa 52:13-15 is typically seen as predicting the passion of our Lord, I believe it applies here as well, because many who think they know what's what do not expect Jesus as he is, and so cannot see how he is acting and what he wills. As C. S. Lewis reminds us in The Chronicles of Narnia, God "is not a tame lion." If we wish to see him, we have to set aside our preconceived ideas and be open to him-as-he-is. That's because he does crazy and unexpected things, like die on a cross or be born in a pigsty.